John Pendegast was a mover and a shaker among Churches of Christ in California. His background was in the under-acknowledged John Mulkey Movement of Tompkinsville, Kentucky. The Mulkey Movement was older than that of Alexander Campbell and operated quite separately for many years. 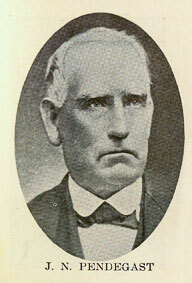 Before coming over the California Trail, John Pendegast had worked with John Mulkey and then became the preacher at Gamaliel Church of Christ in Gamaliel, Kentucky. The church still exists with its own website. "Uncle Pende," as he came to be known all over the State - was loved not only for his works' sake, but for his tenderness of heart, his jovial disposition and his interest in human kind. He enjoyed a good joke and could tell one with as much zest and satisfaction as any man I ever met. Socially he was a great favorite of the rich and poor alike. He had in him that rare faculty of being "something to all men, that he might gain some." Like his Master, he was equally at home at the "wedding feast" enjoying the festivities of such occasions, or at the house of mourning, comforting the Marys and Marthas of a weeping world. As a preacher he was not so methodical as Thompson, nor so impassionate as McCorkle, but he was more tender and tractable than either. He had a happy combination of method, of tact, and of broad human sympathy. He was possessed with a good English education; he had taught school, had studied law, and was admitted to the bar before he became a Christian. His native state was South Carolina, but his parents moved to Virginia when he was a child. It was there that he came in contact with the plea of the Disciples, and he was so enraptured with it that he gave his heart to God and dedicated his life to the plea for Christian Union upon the basis of the "restoration of the New Testament Church in its doctrine, its ordinances and its fruits." In making this decision, he tells that he "conferred not with flesh and blood." He gave up all of his former plans, the flattering prospect of a brilliant career and a lucrative practice in the legal profession for which he had been carefully trained; he laid it all upon the altar of self-sacrifice to God, and counted it but refuse that he might win Christ and become a winner of souls for His glorious Kingdom. One puzzle for the researcher is the spelling of John's name. In all references to John in Kentucky his name is spelled Pendergast, while all references generated in California name him John Pendegast. A street in Woodland still bears his name and the spelling is Pendegast. His father was Nathaniel Pendergast. Spelling on the frontier was not as precise as now. We have seen signed documents where the signer spelled his own name wrong. Whatever the reason, the reader should know about the change of spelling. John was born in Tompkinsville, preached in Kentucky and then came over the trail to finally settle in Woodland. He was one of the founders of Hesperian College.